Corpus delicti. That's the latin phrase for body of crime, a principle that crime must be proven before a person can be convicted of committing that crime. The choice for the title wasn't explained in the book and I can't make sense of it. Serge Birault actually studied the law before he became an artist. This is a delightful book. The lady you see on the cover is actually Serge Birault's girlfriend. She's detaining the octopus, and it's probably cooking something foul judging from the HUMAN SUSHIS hat on its head. Oh, she forgot to remove the chopper from its tentacles — must be a new cop. Somehow, this must be linked to the book title. Serge Birault's illustrations are wonderful. They are cartoons usually, but they have amazing realism with hints of caricature. The characters look real, feel real. I love the expressions on the faces of all the pin-up girls. 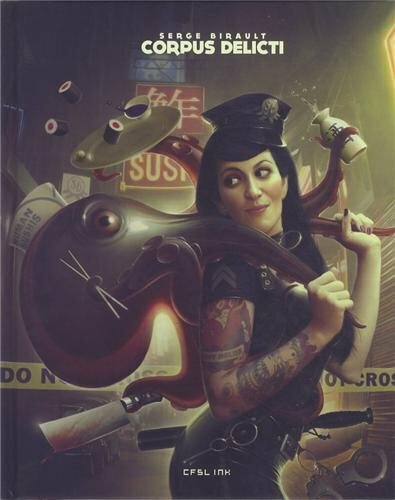 Yes, it's a pin-up book with lots of beautiful girls with the occasional tentacles. Serge Birault is a French artist trained in classic painting but now paints digitally with a flair. This guy is all for the details. He can use up to 1000 layers in Photoshop — who even keeps track of the number of layers, and count them!? Also included are some more experimental portraits which he calls doodles. I love the pencils sketches too. Right at the end he talks about his process of painting. There are step by step pictures but it's not really technical talk, just the challenges of creating realism and some drawing tips. It's a great artbook. 144 pages. Hardcover. Large. If you like pin-ups, you'll love this.